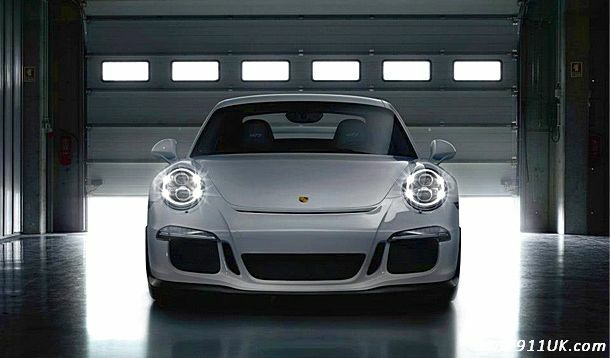 The Porsche 911 celebrates its 50th anniversary in 2013, and there is perhaps no better way to begin the celebrations than by opening a fresh chapter in the arena of high performance sports cars with the new 911 GT3. In 1999, the then-new 911 GT3 set the benchmark for road-going sports cars with the fastest ever production car lap of the Nürburgring-Nordschleife, and established a reputation for itself as the definitive circuit-bred sports car. 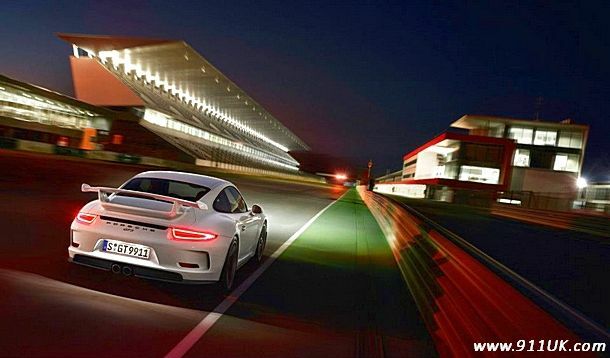 A total of 14,145 GT3 cars have since been built, over four generations. Now, the fifth generation of the 911 GT3 makes its debut at the Geneva Salon, and is set to take on the pole position among thoroughbred Porsche sports cars with naturally aspirated engines. The engine, transmission, body and chassis are entirely new, extending the breadth of ability offered by the previous 911 GT3 by an impressive margin. Together, they ensure that the proven characteristics of this track-inspired sports car are preserved, while also allowing more sophisticated day-to-day suitability – not to mention a highly emotional ‘fun factor’. 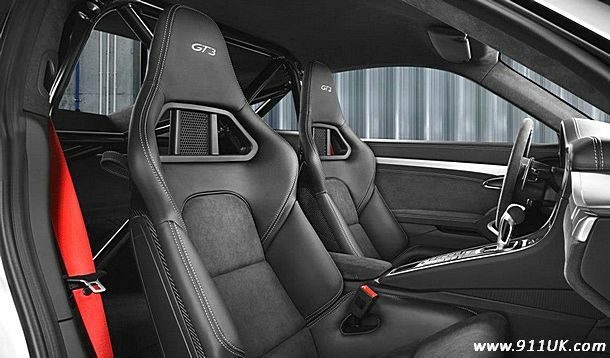 The powertrain of the new 911 GT3 comprises a 3.8-litre flat engine developing 475 hp (350 kW) at 8,250 rpm, a Porsche Doppelkupplung (PDK) double-clutch gearbox, and high-traction rear-wheel drive. The six-cylinder engine is based on that fitted in the 911 Carrera S, but shares only a few common parts. All other components, particularly the crankshaft and valve train, were specially adapted or developed for the GT3. For example, Porsche is once again using titanium connecting rods attached to forged pistons. These basic modifications set the stage for an extreme high-revolution engine capable of reaching up to 9,000 rpm. The dual-clutch gearbox is another feature specially developed for the GT3, with characteristics inspired by the sequential gearboxes used in motor racing, thus granting the driver further benefits when it comes to performance and dynamics. 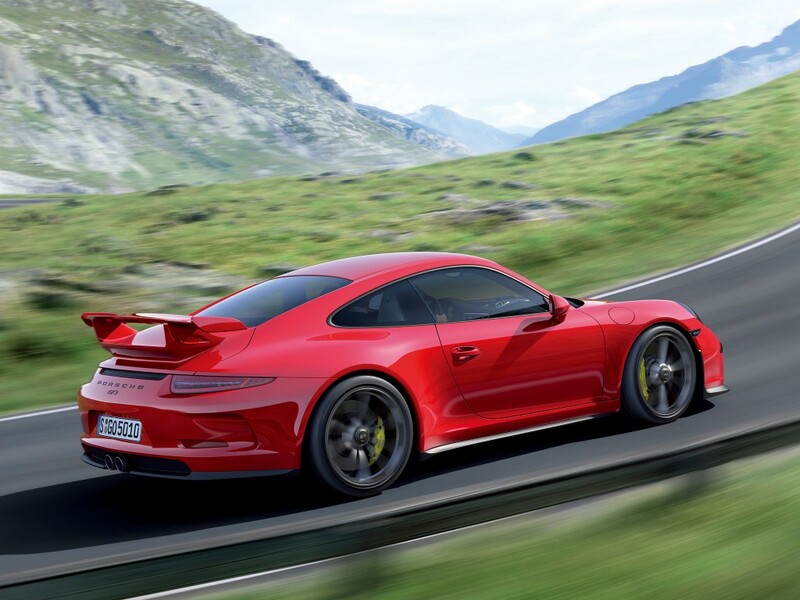 The new 911 GT3 is designed for further gains in precision and lateral dynamics throughout. Porsche is using active rear-wheel steering for the first time. Depending on the speed, the system steers in the opposite or the same direction as the front wheels, thereby improving agility and stability. Among the other new driving dynamics features are the electronically-controlled, fully variable rear differential lock, and the dynamic engine mounts. The height, toe and camber of the newly-developed all-aluminium suspension is still adjustable. The new, 20-inch forged alloy wheels with central locking are used for optimal contact with the road. 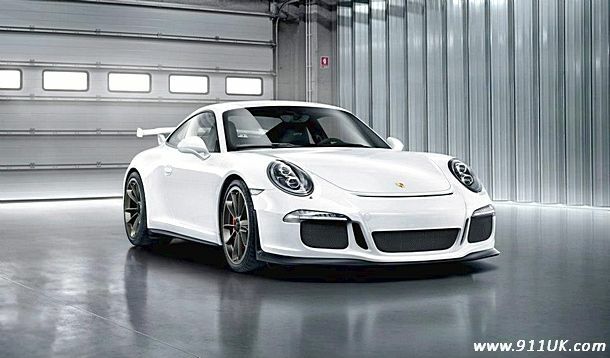 Traditionally, the 911 GT3 comes as a two-seater based on the lightweight body of the current-generation 911 Carrera. However, the front and rear part are always model-specific. 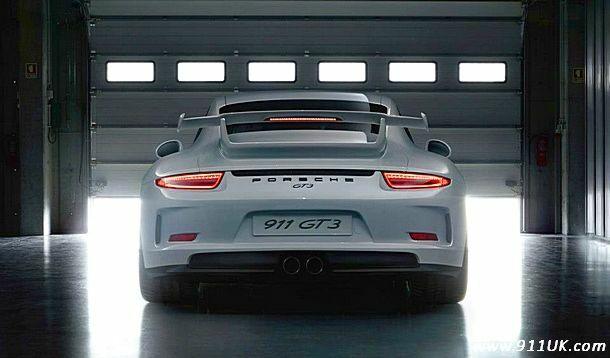 For this latest generation, the 911 GT3 is 44 millimetres wider than a 911 Carrera S across the rear axle. Another clear identifying feature is the large, fixed rear wing. 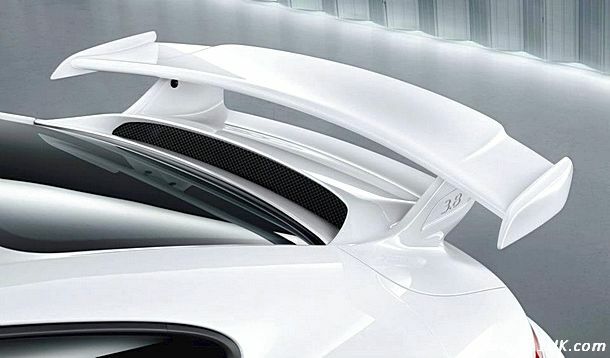 This makes a decisive contribution to the exemplary aerodynamics of the new 911 GT3, which combines low air resistance with a further increase in negative lift (downforce). As a result, the new 911 GT3 once again sets fresh record performance values. At full acceleration from a standstill, 0-62mph is passed after just 3.5 seconds, and 124 mph in less than 12 seconds. The top speed of 195 mph is reached in seventh (and thus top gear) of the PDK transmission. The lap time on the Nürburgring-Nordschleife is even more impressive: the new 911 GT3 completed this track, commonly regarded as the most difficult in the world, in less than 7:30 minutes. While every Porsche is proven around the Nürburgring, this credential is particularly relevant for the new model as around 80 per cent of 911 GT3 customers also drive their cars on race tracks. 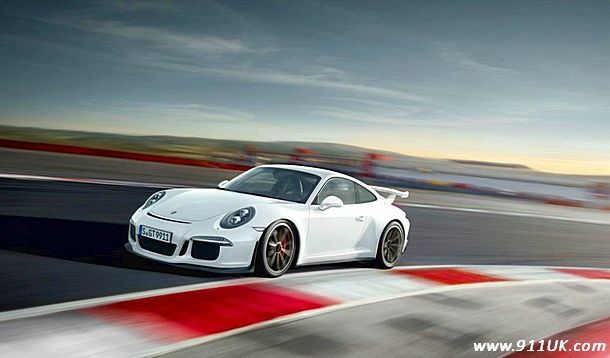 The Porsche Motorsport Department has an entirely new engine for the 911 GT3. This characteristic flat-six is a synthesis of the previous GT3 high-performance engine, the potential of which had been largely exhausted, and the new powertrain generation of the current 911 Carrera series. For instance, the new engine comes with typical motor sports characteristics, such as dry sump lubrication, a high-revving capability and forged titanium components. These are combined with cutting-edge technologies of production engines such as direct petrol injection, demand-controlled oil pump, and lightweight design and materials. The resulting engine weighs around 25 kg less than the previous unit, and exudes motor sports performance values, thanks to a power output of 125 hp/litre of displacement. The structural changes to the base engine had one principal goal: to develop the characteristic high-revving concept of the 911 GT3 further still. High engine speeds enable high performance gear changes, whereby the revolutions remain in the range of maximum power after shifting up. The consistent development focus made it possible to increase the maximum engine speed to 9,000 rpm, enabling the 911 GT3 to reach peak performance values among street-legal vehicles. The foundation for this outstanding performance is the low moving mass of the crankshaft and valve train. As with the previous model, the new 911 GT3 features forged aluminium pistons and forged titanium connecting rods. Forging these highly stressed components means that they are particularly strong, and yet lightweight. Furthermore, besides the hollowed valves, the new valve rocker arm control was a prerequisite for getting up to very high speed ranges. The low moving masses mean that the 911 GT3 engine also has unique speed dynamics with excellent response across the entire rev range. The focus of the new development was the cylinder heads, which differ fundamentally from those of the base engine, and were specifically developed for the 911 GT3. To enable peak performance and engine speeds, the new cylinder heads feature large intake and exhaust ports, large valves, and separate valve control with rocker arm. Cooling and oil supply are also particularly powerful to account for the high loads. The valve actuation via rocker arms with hydraulic valve clearance compensation is another unique feature. The concept embodied in the 911 GT3 engine originates from racing and allows very high engine speeds on the one hand, while the other cams with performance-oriented profiles permit large strokes and long valve opening times. The advantage of the rocker arm control is mainly in the low moving masses that allow high engine speeds, and the large contact area between the cam and rocker arm. As was the case in the previous-generation engine, Porsche is once again using the variable valve control system VarioCam. The continuous angle adjustment of the camshafts allows both high torque and high performance levels, and contributes to the meeting of emissions laws. The vane adjuster is made of aluminium to reduce weight. Each cylinder head is equipped with an integrated actuator for one of the high-pressure pumps of the direct petrol injection system. Unlike the base engine, which is supplied by an axially-arranged high pressure pump, the new 911 GT3 therefore comes with two radially-driven high pressure pumps. 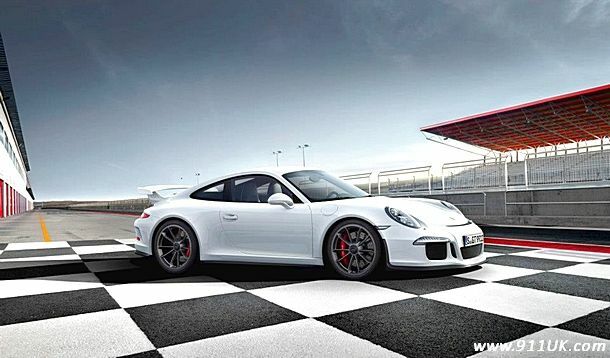 For the first time, Porsche has opted for a 911 GT3 engine with direct petrol injection. Compared with the previously used conventional manifold injection, this technology has proven itself in Porsche sports cars, since it permits higher power and torque, as well as yielding higher efficiency and lower CO2 emissions. For use in the 911 GT3, this technology has been developed further, specifically with performance in mind, and features a specially developed injection system with multi-hole injectors and significantly higher injection pressure. Compared with the swirl injectors of the 911 Carrera models, multi-hole injectors provide a larger usable range of fuel quantity injected. The new GT3 comes with six-hole injectors, which permit sensitive injection with small throughputs and high maximum throughput for high engine performance. The two fuel pumps generate a system pressure of up to 200 bar. This means more fuel can be injected, which is also sprayed more finely. As the designated sports car for the race track, a dry sump oil supply continues to be used for the 911 GT3. This meant that the oil pan had to be entirely re-developed. Just like the base engine, the high-performance engine is equipped with four suction points in the cylinder heads, an extraction in the oil pan, and an oil pressure pump. The engine of the 911 GT3 has two additional suction points in the oil pan at the front and rear, so as to be able to safely transfer oil to a separate oil tank during heavy acceleration and braking phases. The standard equipment of the new 911 GT3 now includes a more advanced generation of the previously optional dynamic engine mounts, which were specially tuned. 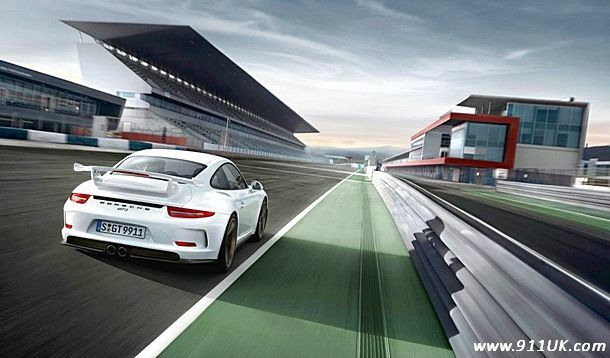 The controller uses the present 911 GT3 sensors to detect a particularly dynamic driving style, and consequently stiffen the normally elastic engine mount. For this purpose, the bearings are filled with a sealed liquid containing magnetic particles, which changes in viscosity when an electric field is passed through. This emphasises comfort in everyday driving; on the race track, on the other hand, disturbing mass impulses from the engine during cornering and braking are compensated. Another advantage is the improved traction when accelerating from a standstill. The intake system of the new 911 GT3 engine is also a synthesis of high-performance components that are based on the basic design. The air inlet is a specific plenum on the rear engine lid, which operates according to the ram-air principle and uses the air flow across the body for increased intake manifold pressure. From the double-flow air filter, this is followed by the flow and resistance-optimised air intake system, which was largely adopted from the current-generation 911 Carrera up to the throttle valve. The plastic resonance intake manifold is also completely new. It is not only lighter than the aluminium system of the predecessor model, but also larger with further aerodynamic improvements. The induction system principle already ensured a fuller torque curve in the previous model. This was further developed and specifically tuned for the new engine. As was the case with the predecessor, the new 911 GT3 also offers the driver the possibility of increasing the pull of the engine in the mid rev-range at the press of a button. When activated, the back-pressure in the sports exhaust system is further reduced, improving gas exchange and thus increasing the torque between 3,000 rpm to 4,000 rpm by up to 35 Nm. 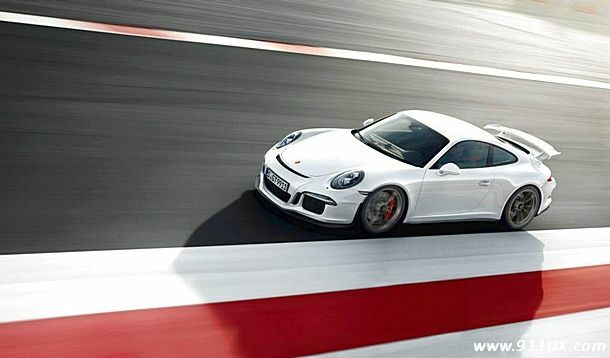 Naturally, the new 911 GT3 still comes with a sports exhaust system, which was largely adopted from the previous model. This means that a high-performance system with powerful fan-type exhaust pipes and two catalysts is used, which are close to the engine and integrated into the manifolds. The two switchable front silencers and a common rear silencer with two central tailpipes ensure that the 911 GT3 meets the requirements for road use. 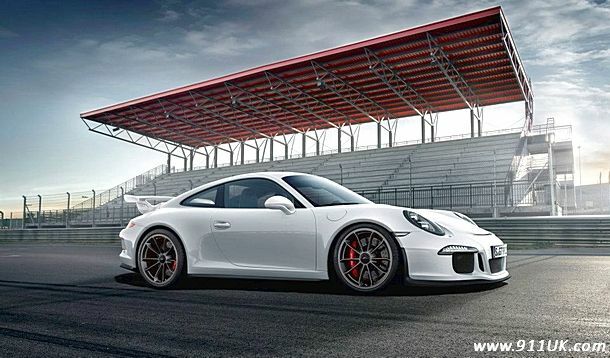 The dual-clutch transmission (Porsche Doppelkupplung -- PDK) originates from Porsche racing, and with the 911 GT3 it returns to the racetrack. The motor sports engineers have revised the PDK extensively both in terms of mechanics and control technology for the new car. The resulting transmission provides the driver with all the essential driving dynamics of the previous manual transmission, complemented with the performance benefits of the dual-clutch transmission. During race track use, it can therefore be driven much like a sequential manual gearbox – with even more performance and emotional driving fun. Two modes are available to the driver: manual shifting or the adaptive shift programme. Manual shifting is achieved using two paddles on the steering wheel, the left-hand for upshifts and the right-hand for downshifts. Shorter shifting travel and optimised actuating force result in even faster gearshifts with concise feedback, similar to the operating characteristics of the 911 GT3 Cup race car. Alternatively, the driver can also shift using the selector lever, with a shift pattern based on that used in professional motor sports: shifting up is done by pulling the lever back, shifting down by pushing it forward. Gear-shifting strategy and response times of the 911 GT3 PDK have been consistently designed for maximum performance, and both are fundamentally different to other Porsche sports cars. This becomes apparent to the driver during manual upshifts in the form of a ‘lightning shift’, which permits reaction times of less than 100 milliseconds. To enhance driving performance, lightning shifts are implemented with a torque overshoot, and the gear change is conducted with a highly dynamic adaptation of the engine speed to the newly selected gear. The switching times are in a range that was previously reserved for the world of motor sports. The dynamics of a sports car driven to achieve optimum lap times is also determined by the clutch. That is why the PDK comes with a ‘paddle-neutral’ feature. If the driver pulls both shift paddles simultaneously, the clutches of the PDK are opened, and the flow of power between the engine and drive is cut off. Once both shift paddles are released, the clutch engages very rapidly if the PSM is switched off. With PSM switched on, the clutch is closed quickly, but in a less pulsed manner. This function offers two principal advantages: the driver can, for example, neutralise the driving behaviour of the vehicle when understeering in a wet curve by pulling the paddles, and thus ‘dip the clutch’ and re-direct additional cornering force to the wheels of the front axle. The second aspect relates to individual influence of the driving dynamics due to the pulsed onset of the driving force when engaging the clutch. Comparable to a traditional clutch with a manual transmission, the rear of the vehicle can be consciously destabilised for dynamic leaning into the curve. Furthermore, the driver can use the paddle-neutral for accelerating from a standstill. As is the case with manual transmission vehicles, the driver alone decides on how to accelerate using clutch and accelerator foot, without any assistance from drive and dynamic handling control systems. 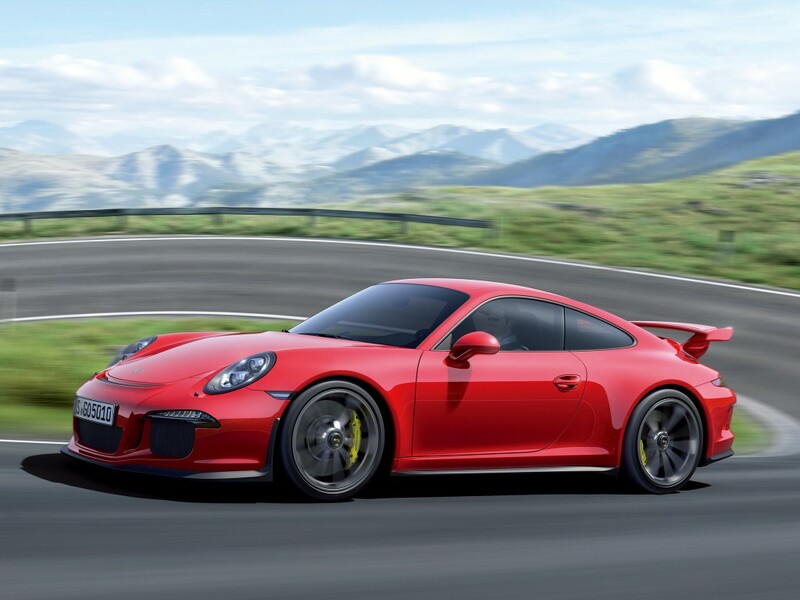 For the first time, the PDK provides the driver of the new 911 GT3 with the alternative of leaving gear shifts to the adaptive transmission control. 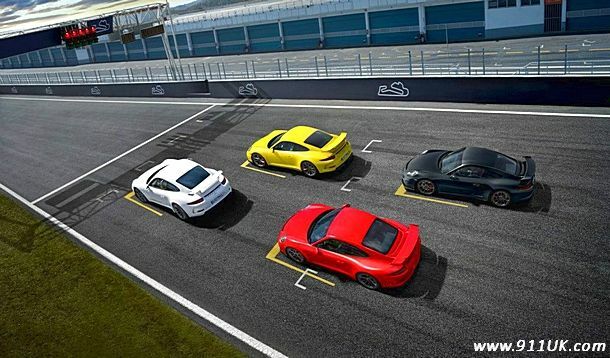 In principle, the PDK of the new 911 GT3 only comes with two switching strategies: Sport and Race Track. This means that the gear changes are always fast. Gear shifts and shift points are adapted to the dynamic style of the driver. Race Track mode is activated by pressing the correspondingly labelled button on the centre console. 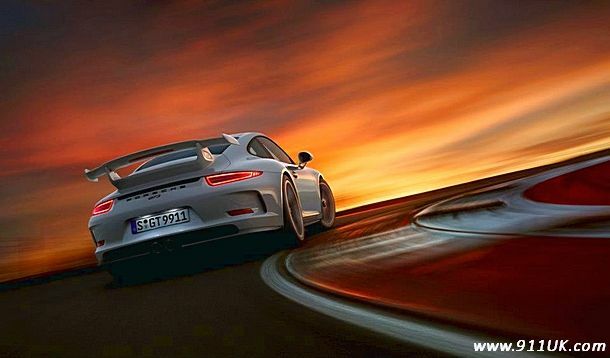 In this mode, the PDK uses shift maps that are tailored to the requirements of pure race track operation. Gears are held longer, and upshifts occur at higher engine speeds. The race track optimisation also entails that the shifting programme is still performance-oriented, even at a moderately sporting driving style. The car is therefore always running at the performance-oriented operating points, and increased traction is available at any time without the driver having to shift gears. The mechanical changes primarily relate to the internal structure of the PDK. For instance, the use of lighter gears and wheels optimally support the engine speed dynamics of the high-revving motor. Moreover, the total weight of the PDK transmission has been reduced by about two kilogrammes. Shorter gear ratios provide completely new characteristics, meaning that the maximum speed is reached in the seventh and highest gear. In conjunction with the rear axle ratio, which was shortened by 15 per cent, the new 911 GT3 therefore comes with significantly shorter gear ratios than the transmission ratios of a 911 Carrera models – in all gears. Just as much as the engine, the chassis of the new 911 GT3 combines the strengths of the previous design with those of the current 911 Carrera chassis. The extended wheelbase and wider track width improve the support base, thereby increasing both longitudinal and transverse stability. All developments had only one goal in mind, namely to increase the driving dynamics even further. With the new car, the performance package of the 911 GT3 has been extended by yet another new feature: active rear-wheel steering. The system comprises two electro-mechanical actuators, which are used at the left and right side of the rear axle instead of the conventional control arms. These allow the steering angle of the rear wheels to be varied by up to about 1.5 degrees, depending on the speed. At speeds of up to 31 mph (50 km/h), the system steers the rear wheels into the opposite direction of the front wheels. 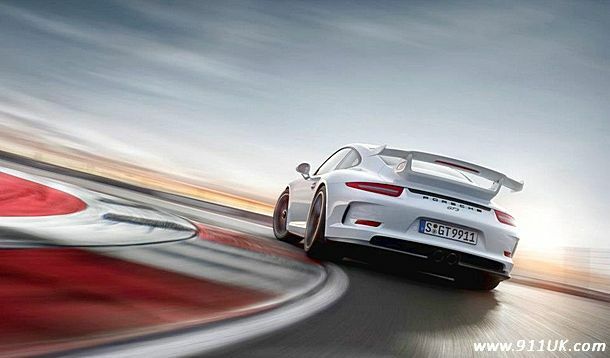 The 911 GT3 enters the curve faster, which permits more dynamic cornering. The ‘virtual shortening’ of the wheelbase by around 150 millimetres also results in significant improvements in agility and everyday usability; the turning radius is reduced, and manoeuvring and parking become much easier. At speeds above 50 mph (80 km/h), the system steers the rear wheels parallel to the front wheels. This results in a geometric virtual wheel extension of about 500 millimetres, thereby increasing stability particularly at high speeds. Simultaneously, the side force on the rear axle triggered by the steering input of the driver is built up much faster than with a non-steered rear axle, which leads to a more spontaneous and harmonious initiation of the change in direction. This variability means that the rear-wheel steering contributes significantly to resolve the inherent conflict of driving dynamics between agility and driving stability. This results in advantages when it comes to agility, driving safety and practicality, as well as increased driving performance. The rear-wheel drive thus played a decisive role in the further improvement of lap times at the Nürburgring. 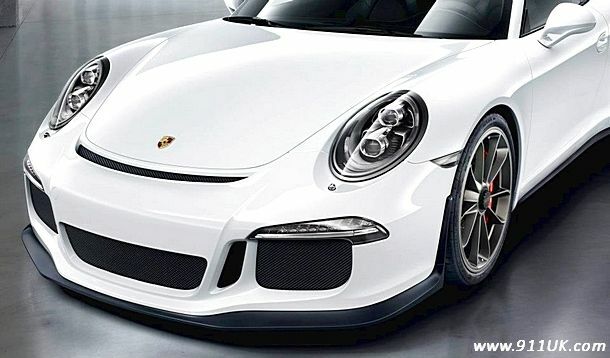 The chassis of the new 911 GT3 is a largely new design based on the chassis of the 911 Carrera, lowered by 30 mm. The Porsche Active Suspension Management (PASM) variable damping system with two pre-selected specially tuned maps is part of the standard equipment, as was the case with the predecessor model. At the front axle, independent wheel mounts, as well as extended wheel bearings and hubs, provide greater stability and strength. The transverse control arm at the front axle is also a new development that yields additional stability and reduced weight. The consistent lightweight design also involves to the use of lighter springs and damper struts with an aluminium outer tube. These two measures alone resulted in a weight reduction of over three kilogrammes compared to standard components. The multi-link rear axle was also largely developed solely for the 911 GT3. Again, independent wheel mounts and wheel hubs, as well as larger mounts, result in increased stability and strength. The subframe of the car, including side panels and control arms, are exclusively made from a hollow aluminium casting, which brings about a weight saving of around 3.9 kg, as well as increased strength. The rear axle now also uses a spring-damper element with a so-called helper spring. 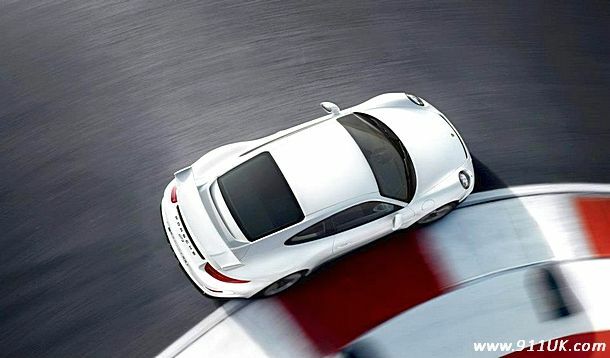 The rear axle of the new 911 GT3 is equipped with Porsche Torque Vectoring Plus (PTV Plus) as standard. 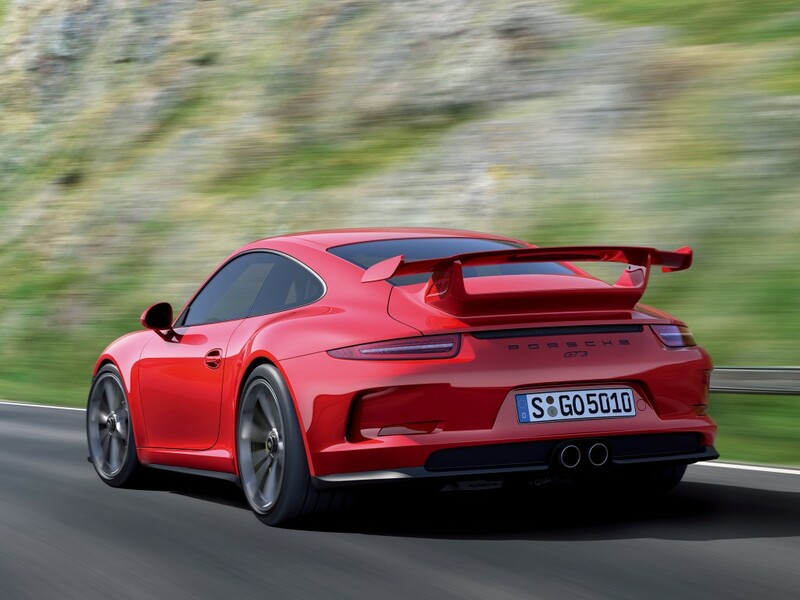 The system, which was adapted specifically for the GT3, consists of an electronically-controlled, fully variable locking rear differential and selective braking interventions at the rear wheels. Together, these features provide high traction on changing road surfaces, an improvement of lateral dynamics, more precise cornering, and increased driving stability. The electro-mechanical steering system was also modified for the new car. The use of characteristics specially developed for the 911 GT3 ensures that the direct steering feel with an appropriate response was preserved in all conditions. The bespoke wheels complete the package of measures for a further improvement of driving dynamics. Compared with the 19-inch wheels of the previous model, the current 20-inch GT3 wheels are not just one inch bigger, but also half an inch wider at the front. The tyres on the front axle are also wider. 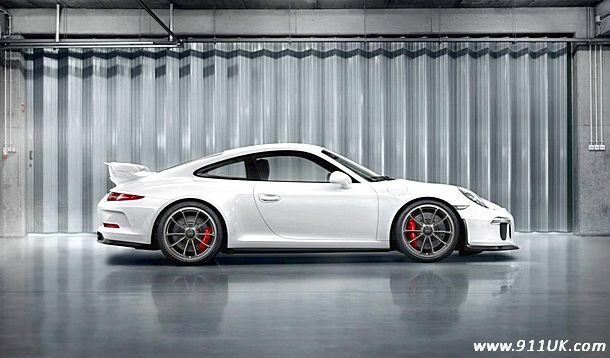 The new 911 GT3 therefore rolls on 9 J x 20 wheels with 245/35 ZR 20 sports tyres on the front axle, and 12 J x 20 wheels with 305/30 ZR sport tyres on the rear axle. The wheels are made of forged aluminium for the first time, offering low weight and high strength. Despite their larger dimensions, the total weight of the wheels including special UHP (Ultra High Performance) tyres is less than that of the previous model. This reduces not only the vehicle weight, but also unsprung mass to enhance driving dynamics. Again, the wheels come with a central locking system, which has been optimised further. Quintessentially Porsche: In the new 911 GT3, more dynamic driving performance goes hand in hand with further improvements in braking performance. At the rear axle, larger brake discs of 380 mm diameter are deployed, the ventilation holes of the discs have been redesigned, and cooling was improved by ways of additional brake cooling ducts on the rear axle. To further reduce unsprung weight, the new 911 GT3 offers the option of racing-derived ceramic composite brake discs with friction rings made of cast iron and aluminium pots, just like its predecessor. The two components are still connected by stainless steel pins. The wide body, the special front and rear design with a large wing, and the larger wheels make the new 911 GT3 unmistakable at first glance. In addition, the new high-performance sports car is also available with a new generation of headlights that exclusively consist of LED light sources, giving the coupé a special appearance. In visual terms, the full LED headlights differ significantly from the standard Bi-xenon system. Instead of a cone-shaped light housing with round projection lens, two tube-shaped light housings are arranged in stages, and the lens contour is truncated at the top and bottom. The basic module in the upper tube is part of the low beam and illuminates the road in a wide and homogeneous manner. 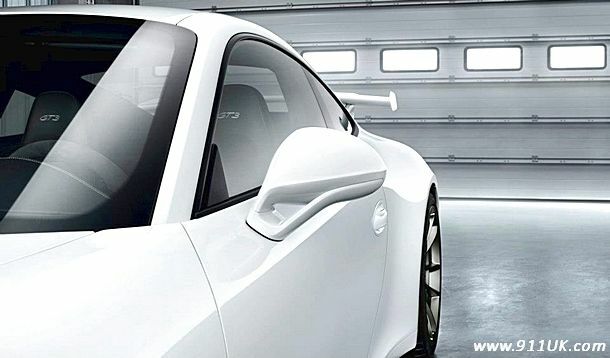 The second part of the low beam is located underneath in the Porsche Dynamic Light System (PDLS). Thanks to its swivel function and variable light distribution, this permits various functions such as dynamic cornering lights and country light, motorway light and high beam. The auxiliary high beam in the upper part of the full-LED headlight consists of two components to the left and right of the base module. Its high position provides an even better illumination of the road. The daytime running light consists of four LED spots and a revolving light ring. 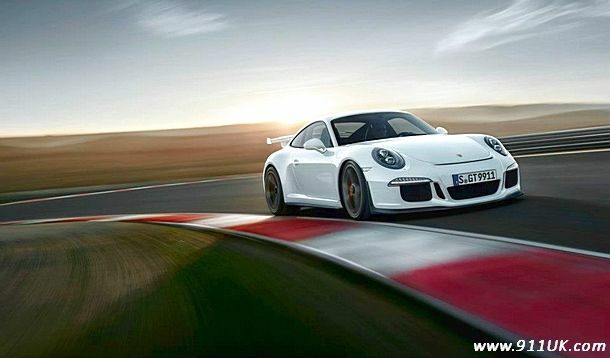 The body of the new 911 GT3 is a development based on the latest 911 Carrera. The extensive use of aluminium in the front and rear body, as well as the floor assembly, reduces the shell weight by around 13 per cent over the previous model. Roof and wings, front boot lid and doors are also made of the alloy. In addition, the torsional rigidity was increased by about 25 per cent. Both factors become immediately apparent when it comes to vehicle dynamics. The front apron has been newly designed for the GT3. In addition to the integration of the new front lights, the larger holes improve air supply to the radiator compared with the 911 Carrera. The conspicuous element of the particularly pronounced spoiler lip is the laterally raised spoiler contour. It comprises of three parts: the continuous horizontal middle spoiler element, as well as the lateral continuations before the wheel arches. All three elements have a scoop-shaped, drawn-out lip, which improves the downforce generated by the front axle. 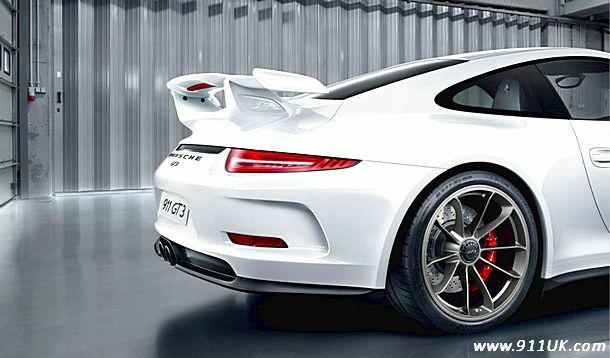 The distinctive identifying feature of the rear of the new 911 GT3 is its engine cover with fixed wing. The completely newly-developed rear engine lid is made of a composite material consisting of glass fibre and carbon fibre. 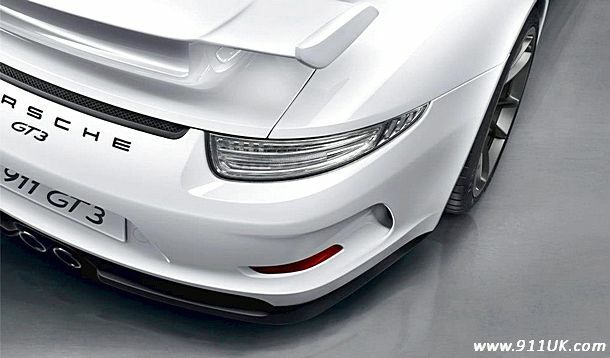 Wing supports, the large ram-air intake for the air supply of the engine, and the spoiler lip are all integral components of the design. The rear wing is mounted on the supports, which remains individually adjustable for use on the race track. Further characteristic features of the 911 GT3 here are the exhaust vents in the rear bodywork, with two on the side and one under the rear boot lid. 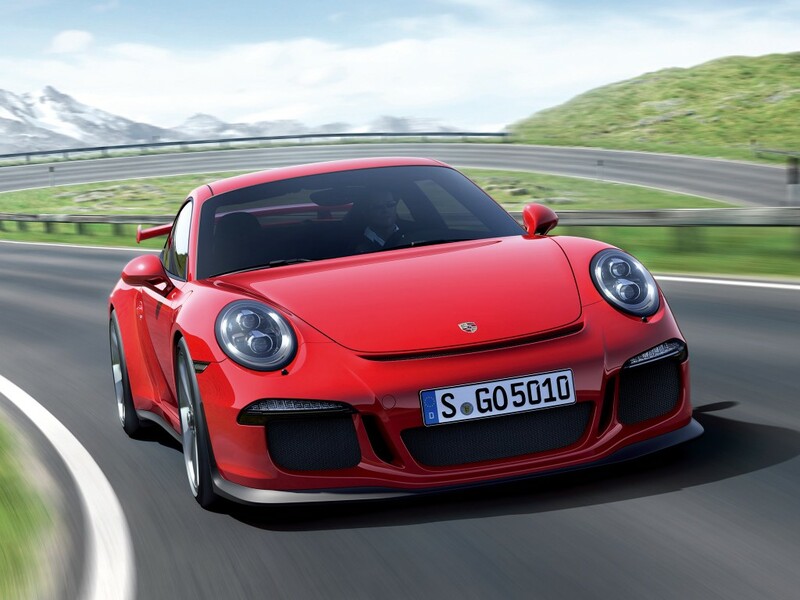 The front and rear design are the result of consistent aerodynamic tuning of the new 911 GT3. This establishes a new balance between the three main requirements of low drag, reliable cooling of drivetrain and brakes, as well as sporting downforce levels at higher speeds. Front spoiler and rear wing provide downforce at the front and rear axle, complemented by the underbody panel, which provides an additional diffuser effect due to its rising contour in the engine area. 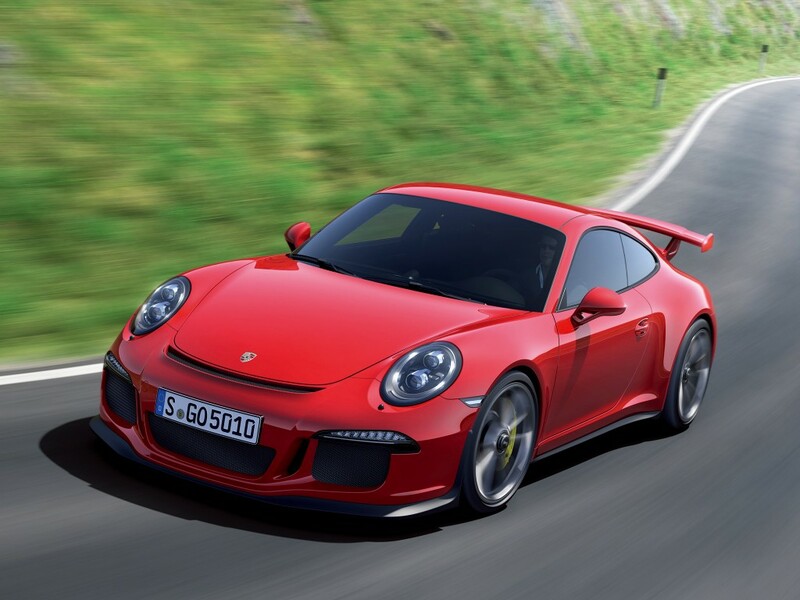 The new Porsche 911 GT3 is available to order now from Porsche Centres in the UK and Ireland priced from £100,540. First right hand-drive deliveries will arrive in November. 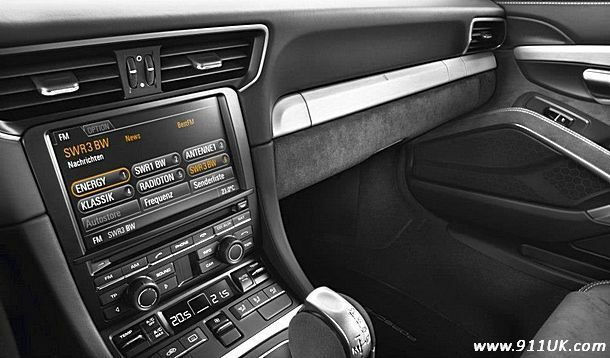 The 911 GT3 has a characteristically sports-oriented level of interior equipment. In addition to sports seats finished in Alcantara and leatherette, standard equipment includes automatic climate control, Bi-Xenon headlights, a universal audio interface offering MP3 connectivity and a three year warranty. Key options include Porsche Ceramic Composite Brakes (PCCB) £6,248, LED headlights incorporating Porsche Dynamic Light System £1,926 and a front axle lifting system £2,023. The popular Club Sport package, comprising a half roll-cage, multi-point harness seat belts, fire extinguisher and battery cut-out switch, also remains a mainstay of the options list. Fitted to every 911 is a Porsche Vehicle Tracking System (VTS), a sophisticated vehicle security package approved to Thatcham Category 5 standard, and customers are also able to explore the potential of their new car by participating in a complimentary course at the Porsche Experience Centre, Silverstone. Body: Two-seat Coupé; lightweight body in intelligent aluminium-steel construction with wings, doors, boot and bonnet lids made of aluminium; two-stage driver and front passenger airbags; side and head airbags for driver and front passenger. Engine: Water-cooled flat-six engine; aluminium engine block and cylinder heads; four overhead camshafts, four valves per cylinder, variable inlet valve timing (VarioCam); hydraulic valve lifter; direct petrol injection; one three-way catalytic converter per cylinder bank, each with two oxygen sensors; electronic ignition with solid-state ignition distribution (six active ignition modules). Electrical system: 12 Volt; alternator 2,100 W; battery 95 Ah, 520 A.
seven-speed Doppelkupplung (PDK) with controlled rear axle differential lock and PTV Plus. Chassis: Front axle: strut suspension (MacPherson type, Porsche optimised) with wheels independently suspended by transverse links, longitudinal links and struts; cylindrical coil springs with internal dampers; electro-mechanical power steering. Rear axle: multi-link suspension with wheels independently suspended on five links; cylindrical coil springs with coaxial internal dampers; active rear-wheel steering. Porsche Active Suspension Management (PASM) with electronically-controlled dampers; two manually selectable maps. Brakes: Dual-circuit brake system with separate circuits for front and rear axles; Porsche Stability Management (PSM); vacuum brake booster; electric duo-servo parking brake; auto-hold function. Front axle: six-piston aluminium monobloc brake callipers, perforated and internally ventilated brake discs with 380 mm diameter and 34 mm thickness. Rear axle: four-piston aluminium monobloc brake callipers, perforated and internally ventilated brake discs with 380 mm diameter and 30 mm thickness. It sounds great to me. No doubt somebody will be along soon to say how it is terrible for not having a Mezger engine, no manual gearbox and a tiny fuel tank. My favourite bit from the press blurb! ......awful looking back-end. Front looks great, engine spec is fab. Let's wait to see how it performs but like the other 991's it does not float my boat........that's just my personal view. "The electro-mechanical steering system was also modified for the new car. The use of characteristics specially developed for the 911 GT3 ensures that the direct steering feel with an appropriate response was preserved in all conditions." 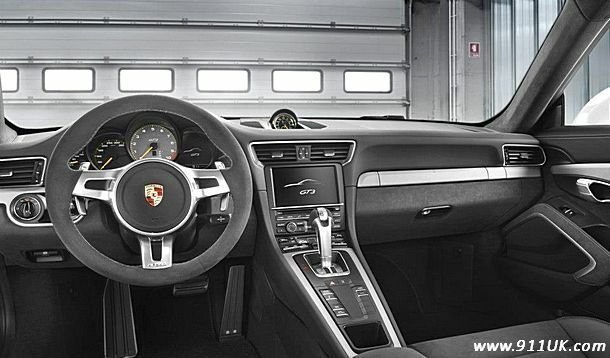 hmmmmm does support the view that the 991 new steering is a bit "remote" just like so many Audi's. .....and at nearly £17k more than the 997 GT3 it needs to be exceptional and a lot better than the previous car. "The smallest feline is a masterpiece"
.....and at nearly £17k more than the previous GT3 it needs to be an exceptional car and a lot better than the previous car. You must be mad, I may not like the look of the back end in those press photos but the photo on PH of a real car look better. The performance of this new car is going to be epic. 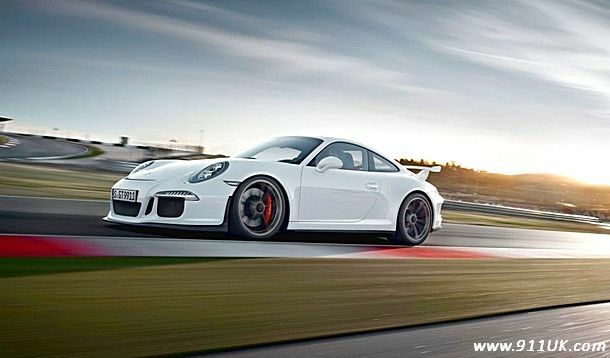 3.5 sec to 62mph is nearly a seconded quicker that the 997.1 this new car is even quicker that the 4.0. Give it 6 to 12 month and a 997.2 at 90k will be laught at. There's a new king in town and it has Pdk. Totally agree, there has been a lot of talk about it not being the real thing. It will put all comers to shame. Lovely RSR photos just shown. Is it true that the RSR and Cup car will usethe old Mezger engine and not the new DFI motor? [Grimacing] "I know where the photos were taken and I don't know how they did it. We want to participate next year [the next day Manthey were announced as running factory 991 RSRs at Le Mans 2013] and, yes, the RSR and Cup will use the old engine. It is very reliable and strong and it does a good job and in the Cup it will be 3.8 litres. It was an easy decision." Never bought into this manual box is best and how great the gear change is in the modern GT3s. If its so great why do so many of us track drivers change engine mounts, gear box mounts and cup cables etc. looking forward to seeing one of these in full flight. Porsche had to go with PDK to stay in the hunt, manual would have been the end of the GT3 brand. Mezgers in the RSR's and Cup's eh. "It is very reliable and strong and it does a good job and in the Cup it will be 3.8 litres. It was an easy decision." What does this say about the 3.8 DFI then? 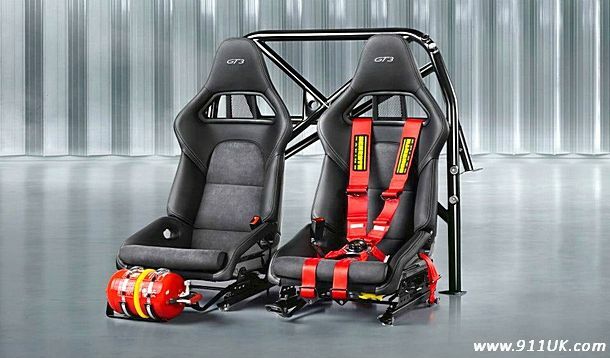 What next, a traditional steering/rack system for the RSR/Cups perhaps? 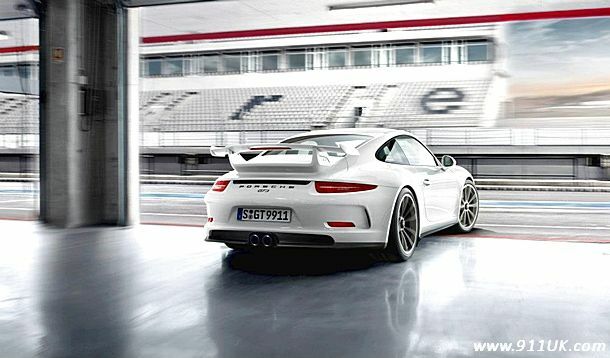 What does the new GT3 actually weight.......I heard 1450/1465? Translated: "Our new engines are good, but we'll use the old one as they are still very good"
If I was shelling out +£100k I'd need to know its engine is bullet proof and fully tested in all conditions and not a "definate maybe"
IMO, Porsche are sending out the wrong message by having the Cups and RSR's on alternative technologies.